In 1853, Edmund Antrobus, a Middlesex Justice of the Peace, proposed the founding of a reformatory-style establishment for young offenders in the county. The idea received sufficient support from his fellow magistrates for the passing of special legislation in the form of the 1854 Middlesex Act, pre-empting the Youthful Offenders Act of the same year. 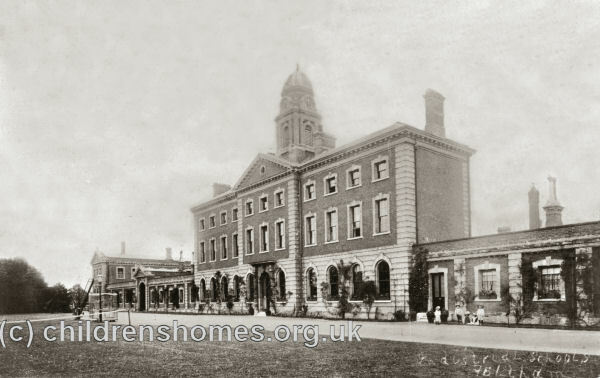 The resulting institution, the Feltham Industrial School, was on such a grand scale — a Palladian building with accommodation for up to 800 boys, with two swimming baths amongst it facilities — that it was not completed until 1859. Its operation was subsequently placed under the Industrial School Acts and in that respect was formally certified for operation on February 13th, 1867, for boys aged 7 to 13 at their date of admission. 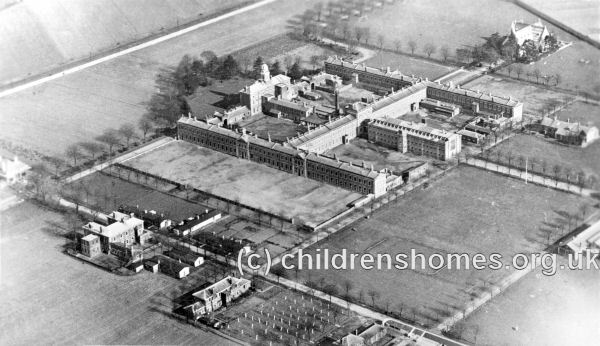 THE MIDDLESEX INDUSTRIAL SCHOOLS, FELTHAM. The site upon which these large structures are in course of erection being nearly level, and consequently without much natural drainage, it was found obviously undesirable to have any part of the building intended to be used for living purposes below the ground line; the architects have therefore very judiciously kept the ground floor of the edifice sufficiently above the ground, so as to allow free ventilation under it from side to side, as the best preventive against damp, or decay of the floor timbers from the effects of dry rot or other causes. Dampness will also be prevented from ascending the walls. 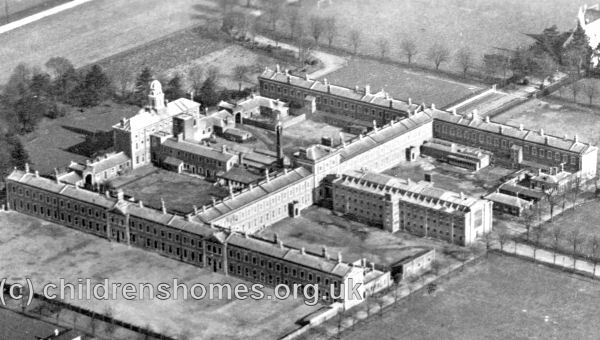 The total area of the ground occupied by the buildings, approaches, shrubberies, chapel, infirmary, workshops, and that for agricultural purposes, is 90 acres 2 perches and 27 poles, which was purchased by the committee for £6,000. The style of the buildings is Palladian, and the materials employed, for reasons of economy, are exclusively brick, advantage being taken of the use of red brick for the general surfaces of the walls, and white brick for the quoins, string-courses, plinths, margins to windows, &c. The plan is arranged in a number of combined blocks, each suitable to the separate accommodation, by day and night, of fifty boys, with their master. The mode adopted appears to have been to settle satisfactorily the special requirements of each of these sectional blocks, and then group them round the domestic offices, stores, and steward's offices in the most convenient manner. With this view, the accommodation for each section is on two floors; the ground floor, containing the school-room, opening to the play-yard, a master's room overlooking both the school-room and play-yard, and a washing-room fitted with every necessary appointment for perfect ablution. Two punishment cells are also planned near the school-room, together with a small room for books and papers. The upper floor is intended to contain the boys' dormitory, and is calculated to receive fifty beds, each 2 feet 2 inches wide and 6 feet long, having spaces of 12 inches between each at the sides, with a wide gangway at the foot, and providing 378 feet cube of air to each occupant of the room. Adjoining to and overlooking the dormitory is the master's bed-room, and outside the dormitory door, on the landing of the staircase, is a water-closet for the use of the boys at night in case of illness. A separate bed-place for a monitor or assistant-master is also provided in the dormitory itself, with a screen to the same, which is moveable at pleasure. The whole of the windows are to be inserted well above the floors, so that ample ventilation may be obtained without draughts. Separate staircases are provided to every section, all of which open from the ground-floor into a general corridor of communication, running entirely round the inner portion of the structure, and giving access therefrom to the kitchen, steward's offices, entrance buildings, &c. Doors, dividing this corridor into lengths, will be placed so as to perfect the division of the sections. The school-rooms are to be lighted from both sides, but chiefly from the outside facades, so that the master standing on that side will be enabled to command a perfect view of all his boys at their desks. For the purpose of insuring a more perfect system of natural ventilation in the school-rooms, there is intended to be arranged near the ceilings smaller windows, opening on the inner courts over the roof of the communicating corridor. The size of the block of building in each of the above sections required for all these arrangements, is 72 feet long by 28 feet deep, in two stories, which combined are ho feet in height; the clear height of the school-rooms and dormitories, &c., being 14 feet. The corridors are 6 feet in width. Separate play-yards, about 170 feet long by 72 feet wide, are also provided. They will each have a covered shed for shelter in wet weather, and each have a door in its lower end, opening on a roadway surrounding the entire building, for access therefrom to the chapel, farm, and workshops, so that the boys of each section may have free access at the proper times to their buildings, but so that they need not mix with the boys of any other section. We may remark that the individual sections which we have above described are complete in themselves, and arranged in pairs, so that two of them can be thrown together at any time if required . This would be effected by the removal of the wall between each pair of school-rooms and dormitories over; and it is proposed by the architects so to construct the floors and roof, independently of the division walls, that such removal at any time shall not derange the adjoining work. Six sections, of three-pair each as described, are placed in each of the side façades of the general edifice, giving accommodation together to 600 boys, while 200 more (making the entire number 800) are provided for, with similar arrangements, in the transverse portion of the building. The central portion of the transverse building is designed to be in three stories, and devoted to the special uses of the steward of the establishment. It will contain on the ground floor his office and stores, and on the two upper floors his bed-rooms, and rooms for mending, classing, and storing clothes and linen. Between the ceiling of the upper story and the roof is a space to be occupied by two large water tanks, for the supply of the establishment; the water being obtained from a large well dug for that purpose, and the water raised thence to the tanks by a six-horse power steam-engine. Two swimming baths are also intended to be provided, in convenient positions, for occasional use. The various domestic offices are planned in the range of the building extending between the steward's office and the entrance building, arranged on each side of a central corridor lighted from above, and communicating thereby with the rest of the establishment. On one side of this corridor are placed the steam-engine house and boiler-house; the washhouse, laundry, mangling-room, drying-room, with hot closets fitted in the usual way, all opening on one side of the inner courts of the structure to a large open space, to be called the "Laundry Court." On the other side of this central corridor, beginning from the steward's office, will he placed the kitchen, scullery, larders, coal-cellar, cook's room, servants' hall, messengers and bed-room, all of which will be accessible by carts from the exterior by means of a second court, to be called the "Kitchen Court." The whole of these buildings are proposed to have iron roofing, while the walls, being entirely of brick, will thereby be fireproof. The boiler-house is intended to be fitted with two boilers, one to be always in use, and a second provided in case of necessary repairs. The steam will work the engine, and being taken to the kitchen, there, by proper application, do all the cooking of the establishment, and also to the washhouse, while it would heat a cistern of water for the supply of hot water to the scullery, baths, and elsewhere where required. By such arrangements it will be seen that the domestic working parts of the institution are complete in themselves, and quite distinct from the school business of the building. The entrance front occupies the centre portion of the main or entrance building, and is three stories in height. 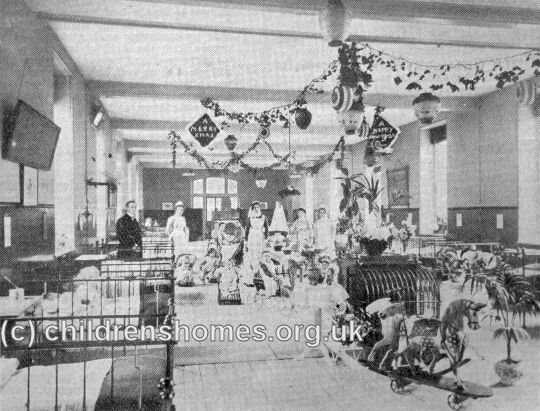 In it is planned a spacious entrance hall 25 feet square, and on one side of it a visiting committee-room 28 feet by 25 feet ; and on the other a dining-room for the committee 27 feet by 18 feet, together with a clerk's room, the chaplain's office, lavatory, water closet, and fireproof room for papers. On the first floor of this block there will be accommodation for the superintendent or chaplain, consisting of two sitting-rooms, six bed-rooms, a kitchen, housekeeper's-room, and other requisite conveniences; and on the second floor are dormitories for such female servants as may be required by the resident chaplain or superintendent. There will be also on this floor an additional water tank and a clock-room, communicating with the turret clock, over which will be the hell-turret and bell. In the lower ranges of buildings on each side of the above are intended to be situated the reception-room and surgeon's room adjoining, a washing-room for boys, two visitors' rooms, a workshop, and bed-room for the engineer in charge of the building, with a room adjoining for fire-engines; also a printing-room, and other miscellaneous accommodation. 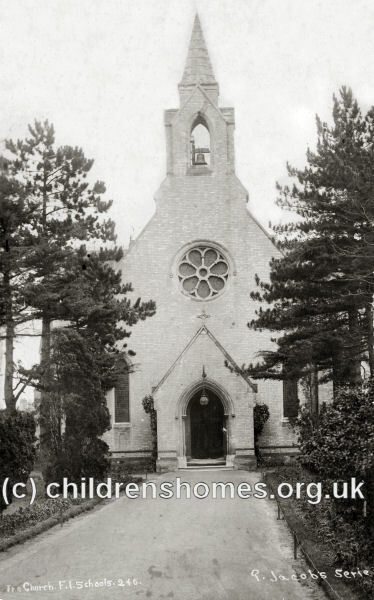 Plans have also been submitted by the architects for a chapel, industrial workshops, an infirmary, and an entrance lodge. These are all intended to be in separate buildings. The chapel will contain sittings for 1,000 boys on the floor, allowing a width of 16 inches for each. The workshops are to be arranged of the sizes and with conveniences found to be most desirable from the experience resulting from an examination of other industrial establishments previously in operation. 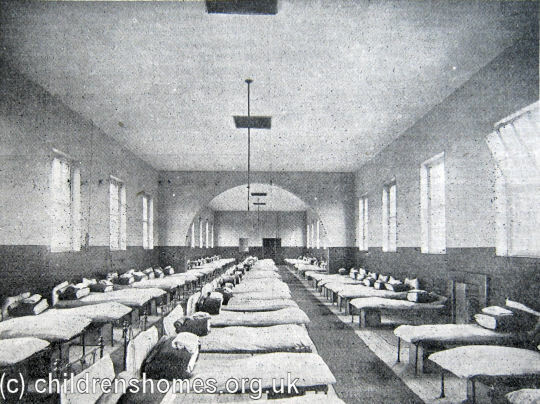 The infirmary is to contain accommodation for 50 patients, and will have a separate kitchen, laundry, washhouse, surgeon's room, foul ward, bath-room, convalescents' day-room, &c. The entrance lodge will be situated on the road between Feltham and Bedfont, and so placed as to command the only road thence to all parts of the establishment, whether to the principal building, the farm, or the shops, so that the lodge-keeper shall thus be directly responsible for all persons entering or leaving the premises. The building is to be amply supplied with water from a well to be dug in the Kitchen Court, near the steam-engine, whence it will be propelled into tanks in the upper part of the centre buildings of the north and south fronts. As forming one of the largest, and, as we conceive, one of the most perfect structures of the kind in the kingdom, we have been somewhat profuse in our description, and may remark, in conclusion, in reference to its external aspects, that the principal facades being in masses of unequal heights, and their central portions finished with pediments, a considerable amount of picturesque effect will be produced; and, as a combined whole, the building will present, when completed, a very different appearance to many monotonous factory-looking structures which have been erected in different parts of the country for similar purposes. Messrs. Banks and Barry, architects, 27, Sackville-street, London, have furnished the designs, under whose superintendence the whole of the works will be carried out. The principal facade of the building measures 360 feet, and the flank ones 400 feet each, enclosed within which are the Kitchen and Laundry Courts, respectively 188 feet by 155 feet, together with four play-yards, each 170 feet by 70 feet, with other conveniences. Mr. John Perry, builder, Bridge House, Cambridge-heath, Hackney, has the contract for the works, whose accepted tender is £47,874. 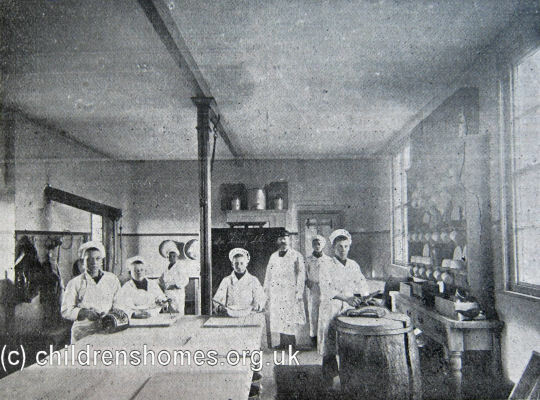 Middlesex Industrial School for Boys site, Feltham, 1895. 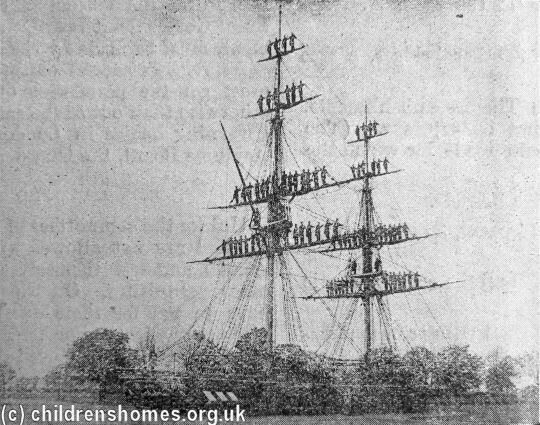 Among the School's training facilities was the brig Endeavour, a fully rigged sailing ship, on which the boys learned nautical skills. In 1889, The London County Council took over control of the establishment from Middlesex. 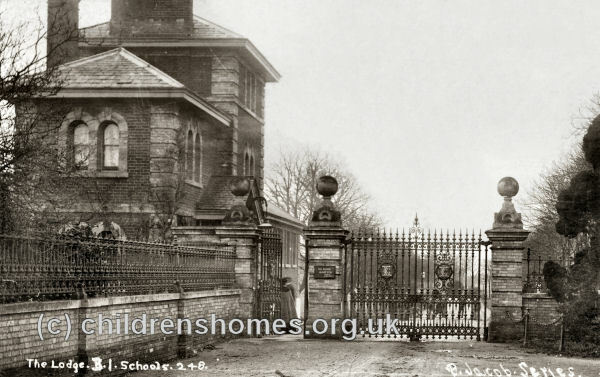 The School closed in 1909 and the premises were taken over in 1910 by the Prison Commissioners as their second Borstal institution.